At one time, having any dedicated speakers attached to your Mac was considered a luxury—forget that most of them produced pretty terrible sound. In the last several years, “computer” speakers have been enhanced to the point where the better models can produce remarkable sounding audio—for a price. And that price has often been in the range of $500 or more. It's into this market that Focal has introduced the Focal XS Book Music System, which brings high-quality sound to your desktop for $399. To do so, some bells and whistles found on other higher-end desktop speakers have been jettisoned. When describing speakers, I often compare their size to another real-world object—a lunchbox, Erlenmeyer flask, or deck of cards, for example. The XS Book speakers are more difficult to describe, as their shape is a little unusual. Imagine a large hard-bound book of around 1300 pages. Now make the middle of that book bulge on each side and add four pounds. That’s the approximate size, shape, and weight of these speakers. Housed within each speaker is a 0.75-inch tweeter and a 4-inch woofer. The right-hand speaker incorporates an internal power supply—no bulky brick cluttering up your desk area—and hosts one set (left and right) of RCA inputs, a 3.5mm stereo input jack, and a single RCA-style jack for connecting the left speaker using the included 1.5-meter cable. A rotating volume control that doubles as a power button also sits atop this speaker. Each speaker sports OmniMount-compatible mounting holes, and Focal includes several 1.5-meter audio cables for connecting sources with 3.5mm and RCA outputs. The bells and whistles specifically missing from the XS Book speakers are USB connectivity—increasingly common on computer speakers—and a remote control. The former means that you must send audio from your computer’s headphone jack or other analog audio-output port, rather than taking advantage of a direct digital connection. The second means that if you want to adjust the speakers’ volume, you have to reach over to the right speaker and twist the volume knob on its top. Given that the speakers are intended to be paired with your computer, this isn’t a huge problem, as you’re likely to be sitting near to them most of the time. However, the XS Book's sound is big enough that you might be tempted to use the system in league with a movie playing on your large-screen iMac, and then shove away from the computer to watch from a comfortable distance. Speaking of big sound, the XS Book has it. The speakers feature crisp highs, reasonably good midrange, and—given the size of the speakers—fairly hefty bass. In fact, I found the bass a little too present, particularly with thumping pop music. The speakers focus nicely when listened to in a near-field position—a couple of feet from your desk—and still sound good from across the room, though the 1.5-meter cable that connects the left and right speakers prevents you from positioning them very far apart. (This cable features a male RCA connector on each end, so you could easily purchase a longer one.) 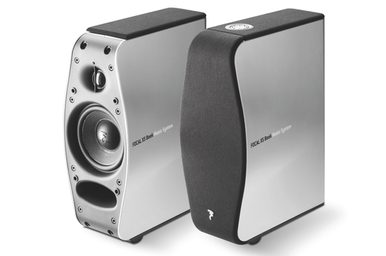 And while the system isn't screamingly loud, it can fill a medium-sized room with sound. The XS Book is currently available from online sources including Amazon and Music Direct, and should be available from the Apple Store online soon as well. When the XS Book speaker system is used in the environment for which it was designed—on your desk, on either side of your computer display—they’re more than a little enticing. While I regret that they lack USB connectivity and a remote control, the loss is understandable given the speakers’ price and sound quality. As with any speakers we recommend, you should audition a pair. I think you’ll like what you hear.